One of my cousins was a bit concerned on reading the above line as my Facebook status earlier this year (Naastik =”athiest” in Hindi), but those, who know about my love for Cricket, understood what I was referring to. 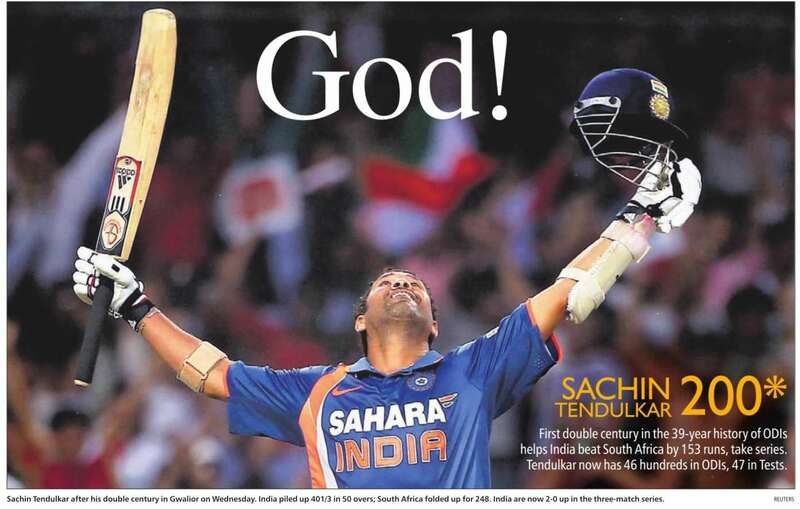 I was referring to my decreasing faith in God of Cricket: Sachin Tendulkar. He has repeatedly faltered, especially in last few months, when Team India needed him to perform miracles. Yes, miracles! After all, that’s what Gods do, and that’s what he was used to be doing in pre-Ganguly era, when he almost single-handedly carried the burden of the whole team. That’s what he was doing when he took India to World Cup semi-final in 1996, Finals in 2003 and finally to being World Champion in 2011! But lately, he hasn’t been at his Godly-best! He is still doing better than most of his teammates, but he could not prevent India’s 0-4 drubbing in England last summer, and then, again by the same margin in Australia a few days ago. I don’t care much about the 100th hundred, but as an ardent fan, I am concerned that it has been close to a year that he has scored a century, which is the longest he has waited for an international hundred (except for his second hundred way back in 1990.). He has again and again failed to capitalize on good starts (Twice falling in 90’s), and I must admit that I am deeply disappointed in him. But it should stop at just that! If you want to stop deifying someone, go ahead and strip him off his God status, but at least, recognize his existence as a super-human (or at least a simple human). You don’t need to turn him into a selfish devil. But this is exactly what a number of Cricket experts and fans are doing. I read this article on Cricketnext, and it made me very angry. And the kind of support the article has got from some of the fans (both in the comments section and on Twitter) made me even angrier. They are calling Sachin selfish and claiming that he is overstaying his welcome in international arena. Many want him to retire from ODIs, and a good number want him to quit international Cricket altogether. I am just a passionate follower of Cricket, not an expert. But since I am a data-driven guy, I thought I could perhaps try to run some numbers to check whether I am just being emotional and supporting my favorite Cricketer blindly. The results didn’t surprise me at all, but I hope they provide some answers to Sachin haters. All the statistics below are based on raw data sourced from Statsguru of ESPNCricinfo. Except for the first graph, which does not include the Ind-Aus ODI on Feb 14, 2012, all graphs are current, as of today (Feb 15, 2012). First three graphs are based on data from last two years, while the last two (will be covered in the next part of this post) span Sachin’s entire career. Since Sachin is overstaying his welcome in international Cricket, at least two or three (maybe more) Indian Cricketers must be consistently performing better than him. Right? Unfortunately, data does not support this. Well, if we go by the two main ODI parameters: batting average and Strike rate, Sachin is still decisively the best! Over the last two years, his batting average is the highest, and his strike rate of 95 is third highest among Indian batsmen. That means he is still scoring runs, and that too at a pretty brisk pace. Even if he is keeping his personal landmarks in mind, he is not slowing down the team’s score rate. Then, what makes him selfish, and how would you differentiate between scoring for oneself and scoring for the team? Yes, the team does have a lot of enthusiastic young Cricketers, and we have learned to win without him in the team, but to say that he doesn’t have a place in the team would be unfair. Coming to test matches, even in his bad patch in Australia and England tours, he was our second best batsmen. I know that from a batting legend, we expect more than being best or second best in a group of non-performers. We want him to win or at least manage draws for us. But overall, Sachin-haters are much less vocal about his place in Test side. This is understandable, because here he stands much taller as compared to the rest in the team, especially when it comes to away-matches. (Graph excludes Kohli, M Vijay and others who played very few matches, but none of them were anywhere near the top ) But it was funny, when after the Australian debacle, one of my very good friends, unfortunately a Sachin hater, posted an FB update asking for forced retirements for Sachin & a couple others, and followed it up with “If required, drop Dhoni and Sehwag from the test squad for the next series” . Forced retirement for Sachin, and “if required” for Dhoni & Sehwag!!! Look at the attached graph and you’ll know why I found this outrageous. I know that Raina, Kohli and Sharma may be the future, but right now, we need Sachin to play at least another year of test Cricket. Another way to look at the comparative performances is to compare share of the team pie, i.e. on an average, how much share of the team’s total is contributed by a particular batsmen. This allows us to take into account the value of a batsman’s contribution in relatively low scoring matches. For example: Dravid’s 146 against England (Oval, 2011; Team score: 300) is far more important than his 119 against West Indies (Kolkata 2011; Team score: 631) To calculate this, I have calculated average of a batsman’s contributions, only for the matches that he has played in. The results may not offer a fair comparison, as I haven’t given any extra credit, if a batsman is not out. Also, this may be a bit unfair to batsmen like Raina and Dhoni, who bat at #6 or #7, and at these positions, usually it is not easy to contribute a lot, as either you under immense pressure because of top order failure, or you don’t have much to contribute, as top order has already amassed a huge total. Still, it can give us some idea about who is contributing the most to team’s score. In the above three examples, I simply proved quantitatively the obvious: “There is still no one in the Indian team, who comes close to Sachin”. But is Sachin really doing very bad, as per his own very high standards. Is this really the lowest point in his career? (Most of you know the answer to this question!). Isn’t two years a long period to compare someone’s current performance? I will try to address these in the next part of this post. Loved it! Sachin haters can go to hell!! Undoubtedly, Sachin has proved himself as the best cricketer, India has ever produced. Even in recent times, he has done better than any other indian but still under criticism. The reason is that anything less than 100 is looked as his failure. But at the same time, critics forgot that he is still among top run getters in that particular innings. Very well written article supported with data. I really appreciate your efforts to defend who-need-not-be-defended. When the right time will come he will be able to silent his critics with his bat.